Looking for great apps at a fraction of their regular price? We’ve found 66 iPhone and iPad apps that are currently on sale. 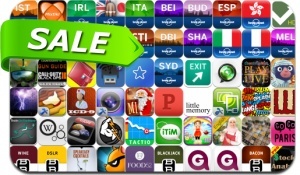 This app deal alert includes King of Dragon Pass, English Country Tune, Pickpawcket, Splashtop 2 Remote Desktop, StockWatch, World Conqueror 2, Pilot's Path, Little Memory, aHomeIcon, PhotoComic, Splashtop CamCam, and many others.